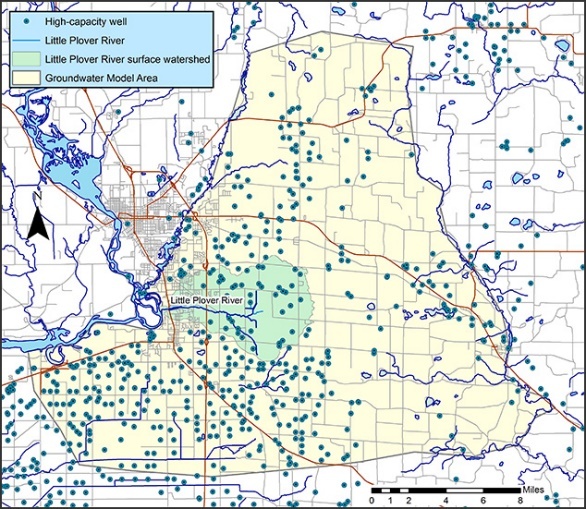 Have you seen the term ‘model’, ‘groundwater flow model’, ‘computational model’ or ‘environmental model’ when reading about water resources issues in Wisconsin, particularly in articles discussing the Central Sands region? Likely, the answer to this question is yes. Yet, you may wonder what modeling is and why it is important. Questions occur, such as does modeling play a role in maintaining Wisconsin’s agricultural productivity? Will modeling aid long-range water resource planning? Are models trustworthy and do they have implications for short and long-term goals you have for your property? Environmental modeling is a mathematical tool for investigating scientific questions involving complex environmental processes. Modeled processes may be related to geology, groundwater recharge and discharge, surface-water flow, groundwater pumping or other land use changes. Models mimic environmental processes at a time scale and spatial resolution that is defined by the user. By focusing on a key question (or set of questions), models can provide a way to assess, measure and predict what factors most readily affect a system as well as how and/or when a system is affected. In Wisconsin, state agencies routinely develop and use environmental models for science-based decision support. Recently, Dr. Ken Bradbury at the Wisconsin Geological and Natural History Survey; Dr. Mike Fienen at the U.S. Geological Survey, doctoral candidate Maribeth Kniffin at UW-Madison, and master’s candidate Jake Krause at UW-Madison have been collaborating to construct a groundwater flow model for the Little Plover River Basin and surrounding area in a study funded by the Wisconsin Department of Natural Resources. In parallel, Ms. Kniffin has been conducting a soil water balance model to estimate rates of groundwater recharge in different vegetation types, which were used in the groundwater flow model. The Little Plover River Basin was chosen for this pilot study because the river has been the focus of recent management concerns and because a great deal of hydrogeologic data already exists for this area. A working version and initial results of the groundwater flow and soil water balance models will be complete in June 2015.The Little Plover River groundwater flow and soil water balance models will enable researchers to test potential decision-making scenarios that affect regional agricultural productivity and sustainability of water resources. This will determine which types of land use and water management practices would be effective within the Little Plover River Basin. Research has shown, however, that in order to use environmental modeling for local decision-making purposes, the stakeholder participation in the development and evaluation of the model is just as, if not more, important as the model results. Stakeholder participation in model development and evaluation process provides the opportunity to raise questions about technical information used in the model, which can improve the model itself. Stakeholder participation can also create a greater public trust in model results and investment in potential decision-making options. With this in mind, Dr. Bradbury, Dr. Fienen and Ms. Kniffin have been interacting with stakeholders during the development of the Little Plover River groundwater flow model. 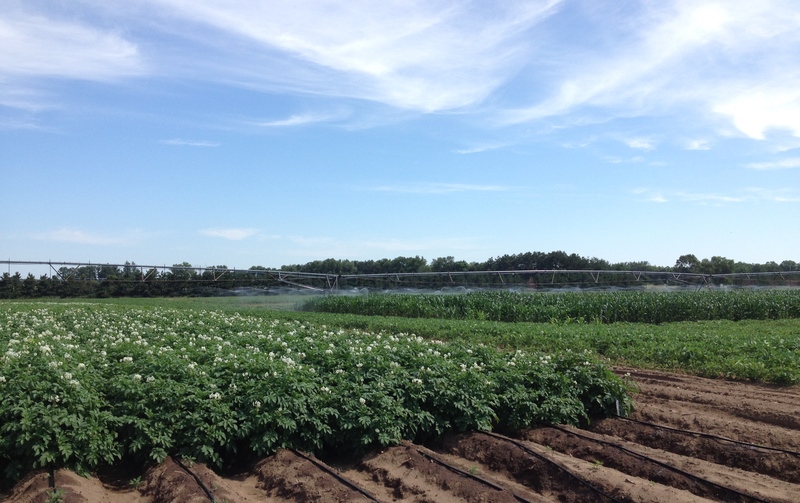 The stakeholders include a broad group that encompasses potato and vegetable growers, the village of Plover, local citizens, Trout Unlimited, the River Alliance and others to provide balanced inputs that represent all view-points. These interactions have greatly improved model inputs, such as irrigation pumping rates, land use and stream flows. Moving forward, Ms. Kniffin’s doctoral research will continue to engage stakeholders in a discussion about water resource management for the Little Plover Basin under different timescales ranging from very short (rainfall events, daily irrigation pumping) to very long (seasonality, climate change, landscape design). Through interviews and small group meetings, Ms. Kniffin will work with stakeholders to develop relevant performance criteria (i.e. minimum streamflows, agricultural productivity) and alternative management practices (i.e. pumping rate adjustments) for model testing. Ms. Kniffin will then conduct a series of model simulations to evaluate the ability of management practices to meet performance criteria and will present the results to the community. 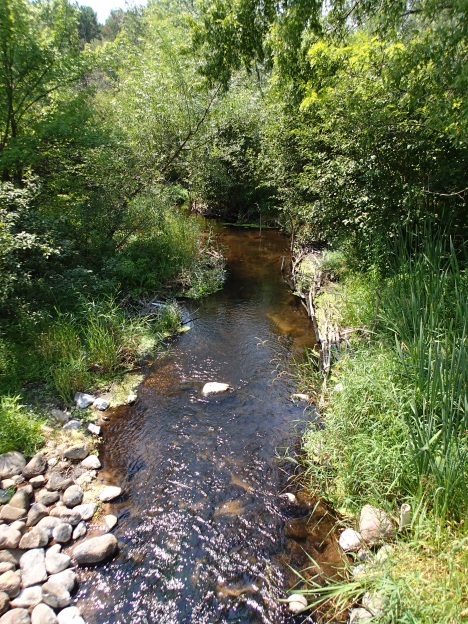 This project will help determine the spatial and temporal scope of future groundwater flow models necessary for decision-making in other areas of Central Wisconsin. For more information about this project, see http://fyi.uwex.edu/littleplovermodel/ or contact Maribeth Kniffin at kniffin@wisc.edu. Ms Kniffin is the recipient of the prestigious Wisconsin Potato Industry Distinguished Graduate Fellowship for 2015-2016.